Premium Nylon yarn provides strength and crush resistance, producing some of the toughest car mats around. The multi-layer backing provides moisture protection and stiffness to maintain shape and prevent sliding around. Camo car mats bring together the toughness and vibrance of premium construction with top industry camouflage patterns that have been proven in both combat and hunting environments. 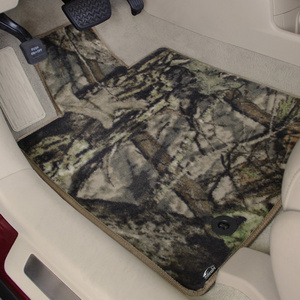 The patterns and weave have been specifically formulated for inherent resistance to stains and fading: these camo car mats look great for years. These mats are as great at hiding dirt as they are at hiding you among the vegetation and terrain on your outdoors trip. Available in 6 camo patterns, 2 industry leading Mossy Oak® Designs and 4 in-house Lloyd Mat patterns - sure to fit your other gear on whatever adventure you chose to take. Matching nylon velour binding that will never unravel. All CamoMats come with a 5 year mat warranty.